In their cramped, temporary studio space, Blugold Radio station manager Scott Morfitt (right) works the dials while host Jordan Duroe thoroughly enjoys himself. Campus-based independent radio station Blugold Radio (99.9 FM) has launched a crowdfunding effort to pay for a new studio. 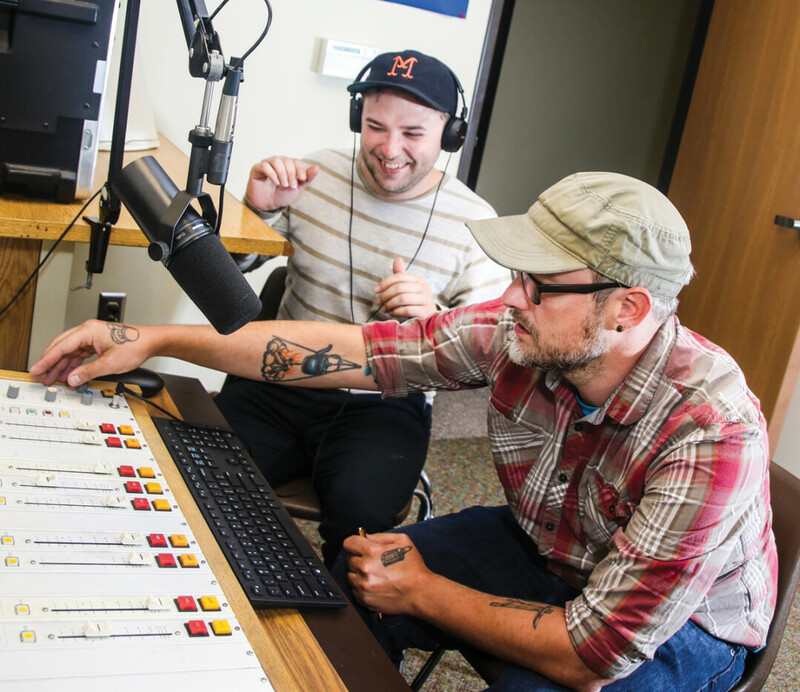 The nonprofit station, which is owned by the UWEC Foundation, went on the air last summer from a temporary studio in Hibbard Hall. The new studio, which will be built near the main desk of McIntyre Library, will give the station space and flexibility for on-air features, interviews, in-studio performances, and literary readings. Blugold Radio says donations will be used for construction, ventilation, and sound dampening. If the station reaches its $7,000 goal, a donor has promised a $5,000 matching gift. To learn more or to make a donation, visit blugoldradio.org.